Help students use pre-search to find jargon and academic language for a topic. This will be necessary to find studies, reports, and articles in a database. If a student wants to research “the science of smelling” he will need to know the term “olfactory.” In the pre-search phase use Wikipedia, along with an online dictionary and thesaurus. I show a video early in the topic selection process from NC State University to explain that topic selection is part of the research process. And furthermore, the selection process is messy. Just watching this video helps the hesitant student to understand that they do not have to settle on a topic the moment the research process begins. It also helps those who come up with ridiculous topics to understand the need to narrow their ideas just by seeing the lack of scholarly research available. Another handy resource for topic selection is a worksheet (PDF) developed by Professor J. Wilkie at Monroe Community College. This worksheet helps students go from a one word topic, to subtopics, to questions, and eventually a topic sentence. Some databases have tools and widgets to help with the process. 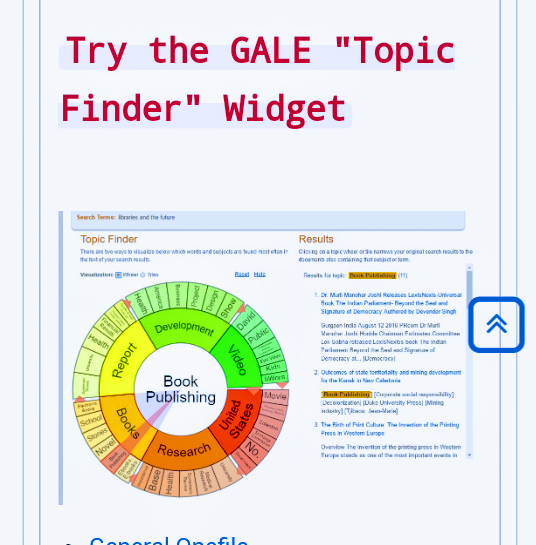 We use one such tool inside the GALE databases. This helps students see just how much is available in the database on their topic. This also provides subtopics they may not have thought about.